At the end of the second Evil Dead episode Ash is sucked into a time warp. His new medieval destination is also infested with undead beasts and demons. With limited technology it is up to him to stop an army of these deadites. Fighting them as well as possession, you get enough action and gory moments to keep you busy, Ash even getting some romance on the side! South African born actress Embeth Davidtz also features! In addition hilarious moments are obviously in ample supply. The expanse of the story and production is obviously a far cry from the modest single location original and is a cool climax to the series. Rabid fans will obviously love another chapter, knowing these guys won't mess up a classic series. 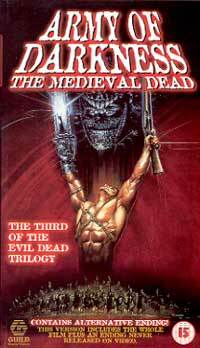 The trilogy was also released in a cool box set shaped like the skin-covered Book of the Dead.